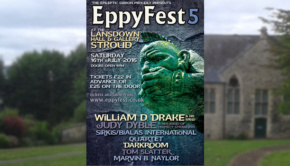 I was not familiar with Marvin B. Naylor prior to catching his set at last year’s Eppyfest in Stroud, and what an enjoyable performance it was, his 12-string guitar and high register voice carrying the audience away on a spacey sound that belied the fact that just one bloke was creating it. A master of the 12-string, Naylor has been plying his trade for decades, regularly busking in and around his Winchester home (as described in entertaining style at his Diary of a Busker website). 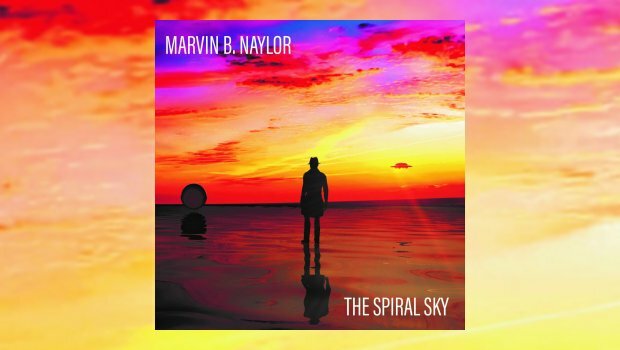 Marvin’s fingerstyle playing shines through on this release, the sound expanded via multilayered guitars and vocals, but that isn’t the whole story as other instrumentation is also added, all seemingly performed my Marvin himself. From the introductory chords, first track Spaceships There Are is crammed with wide-eyed enthusiasm and interesting additions to hold the attention in a rich and full sound that ends in a rockier vein. Marvin’s love of space and Sci-Fi is often prevalent in his work, the instrumental Moonsets on Aerah featuring an interesting jangle with chord shards as accents. Back down to Earth, the first rush of young love shines through in Ode To Peggy Christie, an energetic yet nostalgic romp, harmonica adding a Dylan edge while the whole remains resolutely English. Marvin is an old romantic at heart, but there’s an edge to Brief Encounter which opens woozily with off-kilter guitar phrases and a hint of Roy Harper before settling down into a picked support to the vocal melody, occasionally reminiscent of Genesis in their more pastoral moments with Steve Hackett on board. The multi-layering of guitars and vocals works up to a maelstrom with some heavier sounds before sliding into a beautifully realised solo piano recapitulation. Very interesting and one of the highlights. Another is Wondering Star, just mandolin and vocal to start, a jaunty melody with sweet asides. It builds as the various parts form an orchestral backing for the layered vocal, all very well executed. A tremulous falsetto features in Talk Me To the Moon, the layered guitars building to an abrupt full stop. It’s brief and feels like an aside rather than a complete piece. There are other downsides, Marvin doesn’t really have the voice to completely deliver songs like When My World Stops Turning which ends up sounding a little monotonous and thin. Peter’s Place works better, nostalgic and warm with chiming 12-string, Marvin’s soft accent giving a personal touch. And is that an accordion in there to underline the French feel? Marvin’s arrangements often forego traditional singer/songwriter styles, sometimes heading off in directions that the likes of The Flaming Lips might find appropriate. His songs are pleasant and accessible with folk and prog additions that give them depth, although the album’s titular reference to Black Sabbath’s Spiral Architect – a nod to Marvin’s youth when, as he says, “everything I listened to was HEAVY!” – doesn’t come through in the music. Other references do though and following on from the startling one man version of Space Oddity at Eppyfest, Human God is Marvin’s David Bowie tribute, utilising various Bowie lyrical notes to fine effect in an enjoyable toe-tapper. The piano led Second Movement has an air of the old Hovis adverts, reminiscences of a time long gone. It’s a beautiful and sentimental melody that expands as more instruments appear, leading to a satisfying and quite lovely conclusion. Finally, the too brief Spirals, a fitting way to end as it builds on strings, but it fades just when it starts to really get going. There’s a genuine quality to Marvin and his music, he’s doing what he does the only way he can and generally the results are a pleasing listen. He can sometimes get a little twee but we can easily forgive him, it’s good to know that he’s out there, playing for the good folk of Winchester who probably don’t appreciate him as much as they should.